Bosselaers, J. and R. Jocqué. 2002. Studies in Corinnidae: cladistic analysis of 38 corinnid and liocranid genera, and transfer of Phrurolithinae. Zoologica Scripta 31:241-270. Biodiversity of Australasian Ground Spiders. NSF Peet Project, American Museum of Natural History. 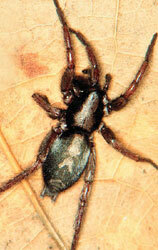 Ground spider, Trachelas tranquillus (Corrinidae). Photograph copyright © Jim Kalisch, Department of Entomology, University of Nebraska-Lincoln. 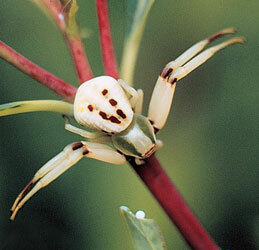 Crab spider, Misumenoides formosipes (Thomisidae). Photograph copyright © David Keith, Department of Entomology, University of Nebraska-Lincoln. 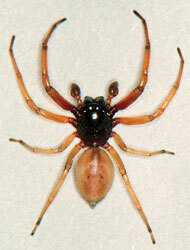 Parson spider, Herpyllus ecclesiasticus (Gnaphosidae). Page: Tree of Life Dionycha. The TEXT of this page is licensed under the Creative Commons Attribution License - Version 3.0. Note that images and other media featured on this page are each governed by their own license, and they may or may not be available for reuse. Click on an image or a media link to access the media data window, which provides the relevant licensing information. For the general terms and conditions of ToL material reuse and redistribution, please see the Tree of Life Copyright Policies.